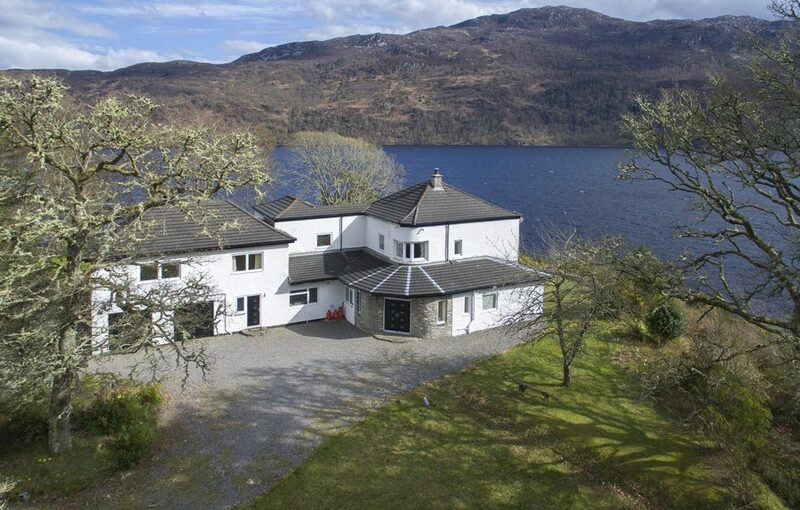 A six bedroom detached house is for sale, offering stunning views over Loch Ness. Presented for sale by Galbraith, Point Clair House was built in the 1930s by a ship’s captain and the nautical influence is evident in its design, where the bow ended front of the property resembles the bridge of a ship. 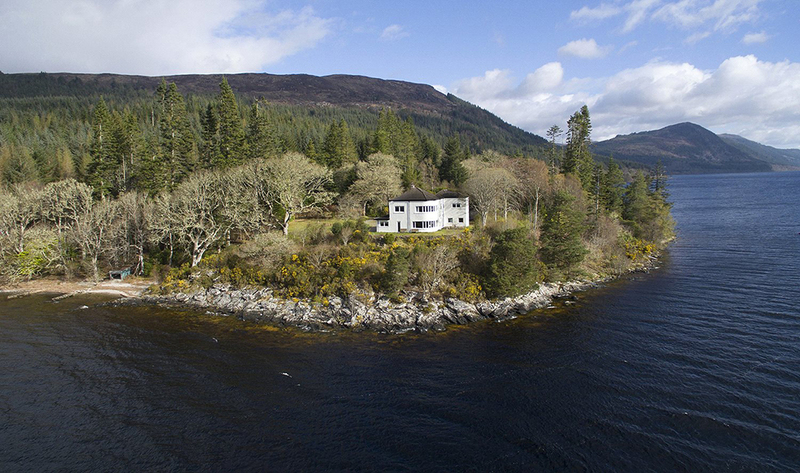 Point Clair House lies on the western shores of Loch Ness between the villages of Fort Augustus and Invermoriston in Inverness-shire. 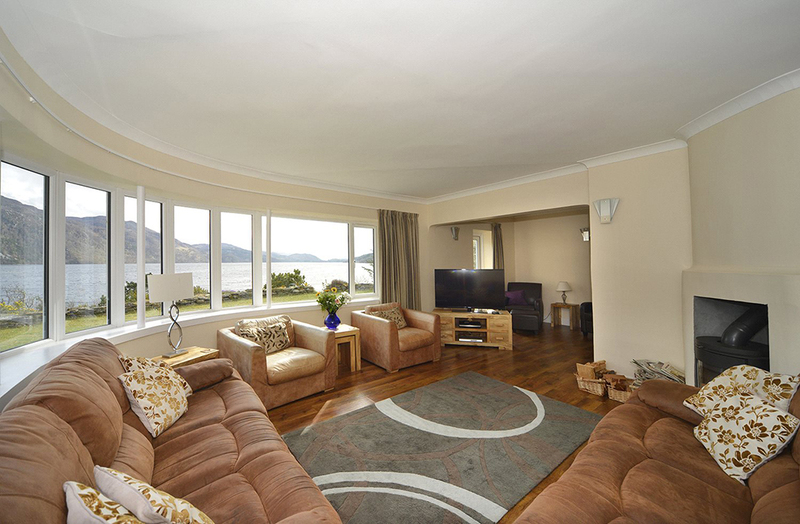 The house occupies one of the finest and most sought after locations in the Highlands of Scotland on the banks of Loch Ness with direct access to the loch from shingle beaches and rocky outcrops. 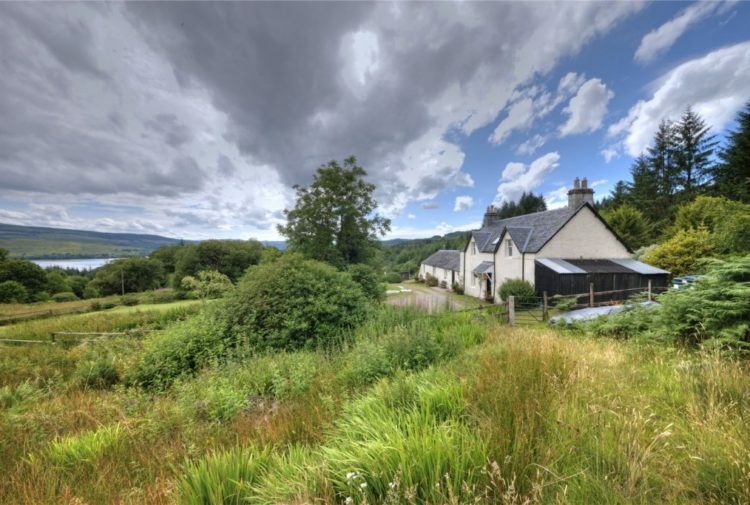 In a private, elevated position, the uninterrupted views from the property are breathtaking and the promontory offers unrivalled views encompassing Fort Augustus Abbey at the head of the loch, the lower slopes of the Monadhliath mountains across the water and northwards towards Drumnadrochit. Point Clair House has been extended over the years and was renovated in 2013 to provide extremely comfortable, well laid out accommodation with views that can be enjoyed from every room. Its understated interior allows the coastal light to fill the rooms all of which have either loch or garden aspects. The delightful grounds at Point Clair House extend to approximately 3.5 acres and are approached from the public road through wrought iron electric gates opening to a cattle grid and lengthy driveway winding through the grounds and to a turning circle and parking area in front of the house. The formal gardens around the house are overgrown, but the framework of flagstone paths, avenues of trees and hedging can still be seen. Inviting paths meander through the wooded grounds leading to hidden viewpoints and to a sheltered shingle beach with former boat house. From the north east of the house a tree canopied, stepped pathway leads to the lochside and natural harbour. Detailed planning consent was granted in October 2017 for two passive houses on a one acre plot on the north eastern boundary of the site. The houses have been sensitively sited to lessen the impact on the amenity and privacy of the existing house and have been designed to have minimal environmental impact. 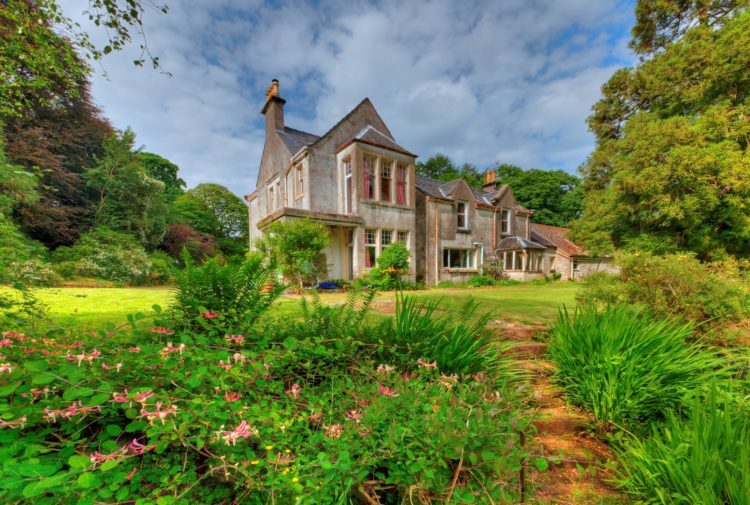 Point Clair House has previously been a successful self-catering holiday let and this consent offers the opportunity to expand this business in one of Scotland’s most popular tourist destinations. 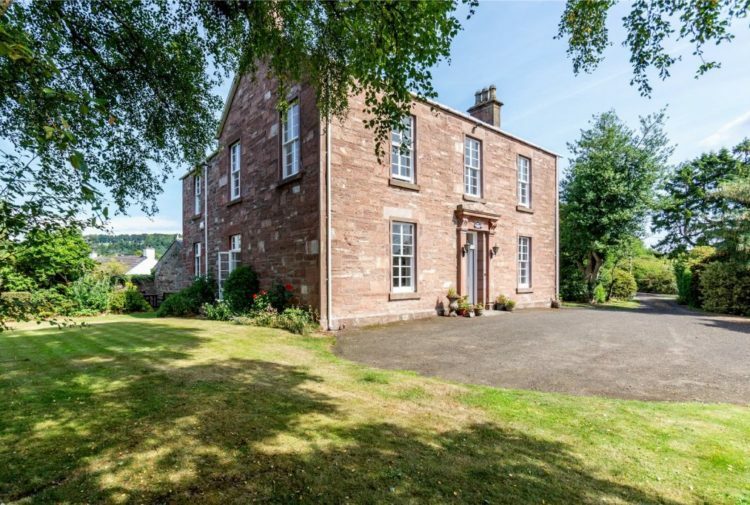 Point Clair House lies in the Great Glen, famous for its breathtaking scenery, associations with Loch Ness and the Caledonian Canal, and its proximity to Inverness, Fort William and Skye. 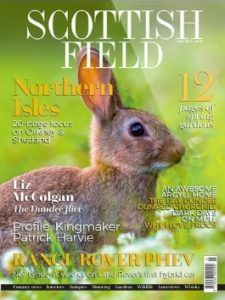 Away from these popular centres though, the beautiful countryside remains unspoilt and tranquil, providing a haven for wildlife and offering excellent sporting and leisure opportunities. As well as the traditional rural sports of fishing, shooting and stalking, the Nevis Range Ski Centre near Fort William offers year round activities. There are many way-marked walks and cycle trails in the area including the Great Glen Way and there are regular sightings of native wildlife in the grounds including red squirrels and otters. Nearby Fort Augustus has a good range of shops and amenities as well as schooling up to secondary level. Inverness has all the facilities of a modern city including its airport with regular flights to the south and Europe. 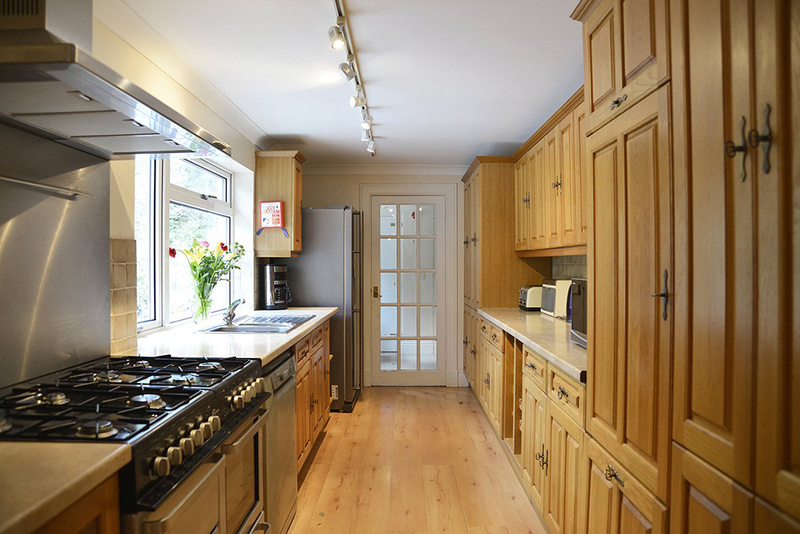 The agents will consider offers over £795,000.